The question always arises in felony cases: "Can I be released from jail on bail while I await my trial?" The answer to this question depends on many factors. There are some types of felonies in Mississippi where the accused can be and almost always is denied bail. These are Capital Murder and many Murder cases. There are many other instances when bail is discretionary with the Court. The Court is required to look in such factors as: 1. the seriousness of the offense and the statutory punishment. 2. the prior record of the accused. 3. the possibility that the accused might harm other people if released on bail. 4. the likelihood that the accused may flee if released on bail. 5. the reputation, background and work or family contacts that the accused has to the community. These are several of the factors that the Court must consider. One may generally assume that if the crime is violent, or a victim is hurt, or the charge involved a large amount of drugs, then bail will be incrementally more difficult. Bail is usually granted for the majority of people charged with crimes. The person arrested has a right to be taken before a Judge within forty eight (48) hours after being arrested, excluding weekends. Many Jails have pre-set bails amounts for nonviolent felonies, so when a person is charged the bail is automatically set by the Court unless the investigating officer makes a request for a higher bail or no bail. Assuming that bail is granted, the person can ask family members or friends to post a cash bond equal to the amount of the bail, or pay a bondsman ten (10%) of the amount of the bail to post a corporate bond. The corporate bond is an insurance company that agrees to pay the full amount to the Court in the event the accused does not appear in Court on the scheduled day. There are some bonds called first offender bonds but they are usually slower and time consuming to utilize. If the accused is released on bail, or stays in jail, then he/she has an initial appearance before the Court. This usually takes place in a City Court, County court or Justice Court. The Judges of these Courts do not have the authority to conclude the felony charge. They may only set bail, advise the person of the charges, and grant preliminary hearings if the person is not out on bail. The sole authority to proceed with a felony charge rests in the jurisdiction of a Circuit Court for the County where the crime is alleged to have occurred. After the accused is released on bail, or if he is denied bail, the case is presented to the Grand Jury. If the Grand Jury returns and Indictment, then the charge is read to the accused in open Court and the Court sets a date for trial. Every person charged with a crime has certain Constitutional rights. For example, the accused has the right to a jury trial; to the assistance of counsel; to confront and cross examine the witness brought against them; to use the power of the Court to subpoena witnesses in their own behalf; and to testify on their own behalf or not testify. If an accused decides not to testify neither the Court nor the Jury can draw any inference or suggestion of guilt from the decision not to testify. The prosecutor is not permitted to comment on the fact that the accused chose not to testify. WHAT ARE THE IMPORTANT STEPS TO TAKE IF A PERSON IS ACCUSED, SUSPECTED OR ARRESTED FOR A CRIME? YOU HAVE THE RIGHT TO THE COUNSEL AND ASSISTANCE OF A LAWYER. YOU HAVE THE RIGHT TO HAVE A LAWYER APPOINTED OF YOU CANNOT AFFORD ONE. YOU DO NOT HAVE TO MAKE ANY STATEMENT TO THE POLICE, OTHER THEN GIVE THEM YOUR NAME, ADDRESS, ECT. IF YOU DO MAKE A STATEMENT, WHETHER ORAL OR WRITTEN, THAT STATEMENT CAN BE USED AGAINST YOU. If is important to remember the above mentioned rights which are called your Miranda rights. The law does not require that police officers tell the truth when they are talking or interviewing a person suspected of a crime. Anything a person says, even if the officer assures them it is off the record, can and will be used against them. 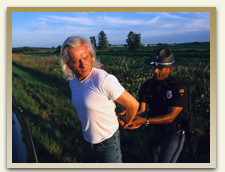 The most prudent policy is to ask to speak to a criminal lawyer before making statements to a law enforcement officer. If you have found yourself on the wrong side of the law and are facing criminal charges, please contact the experienced criminal lawyers at Coxwell & Associates, PLLC today to schedule a confidential meeting.